Most business owners don’t fully understand the effects of long-term interest or how an amortization schedule works. As a result, they get locked into a loan and end up paying more interest than they had planned for or unaware they could have saved money on interest if the payment schedule was changed. If nothing else, they’re less informed than they should be, and this can affect everything from business decisions in the case of a business loan to personal ones in the case of a car loan, mortgage, or other. So how do you know what part of your monthly payments are interest and principle? That’s where your amortization schedule comes in. An amortization schedule is a breakdown of your periodic loan payments. If you have a business loan, car loan, mortgage, or similar loan your amortization schedule tells exactly how each payment is divided into principal and interest until the end of the loan term. Typically, all payments at the beginning of a loan term are the same, with more of each payment going towards interest. However, as you move further into the loan term payments are comprised more of principal. So, why should you care about all this? Understanding your amortization schedule better can do several things. For example, it can help you calculate how long your car loan will be upside down. This can play a big role in deciding when you purchase a new car. In addition, it can help you decide exactly when is best to refinance (without having to use outside resources to check this for you) and when will be best to sell your home in the future. In general, more knowledge is never a bad thing when it comes to financial matters. The more you know, the smarter decisions you can make– decisions that can have a big impact on your future. If you don’t have easy access to your car, mortgage, or other loan amortization schedule, it’s pretty easy to calculate it yourself based on your current payment breakdown and interest rate. For example, let’s take a $250,000 loan with a term of 30-years, a 4.5% interest rate, and $1266.71 monthly payment. First, to calculate your first month, multiply your $250,000 loan balance by the periodic interest rate. Many think that you simply take the interest rate and multiply it by the balance, however, loans are actually calculated using what’s called the periodic interest rate, which is the interest rate divided by the interest method (monthly, annually, etc.). If your loan is annual, as most debt is, you divide your 4.5% interest rate by 12, which equals .00375 (or .37%, less than a percent). So, in our example, $250,000 divided by .00375 is $937.50. So, that’s our interest. 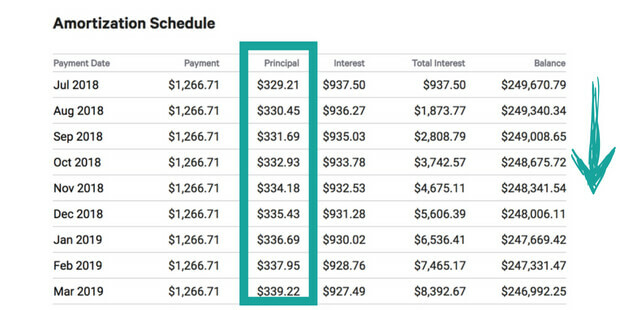 Now, simply take that $1266.71 monthly payment, subtract your $937.50 monthly interest, and you have the amount that goes toward principal for that first payment ($329.21). However, keep in mind that the next month’s payment will be different between your balance is now lower than the previous month. So, to calculate the following (and all following) month’s payments, take that $329.21 monthly principal amount and subtract it from the loan balance, which leaves $249,670.79 remaining. From there, run the same calculation we did in the beginning, calculating the periodic interest rate from the new loan balance. Understanding the effects of long-term interest– preferably, before you commit to a long-term investment– is critical. Not only to make sure you stay on track when making payments but so that you make the best financial decisions for your business moving forward.